The following explanations apply to the case the product is functioning satisfactorily. Should there be any moves different from the following contents, some sort of faults may have occurred. Immediately look into the cause of the fault and eliminate the cause thereof to ensure satisfactory operation. While the power is connected, the fluorescent light in the billboard is on and demonstration images and ranking data are displayed. 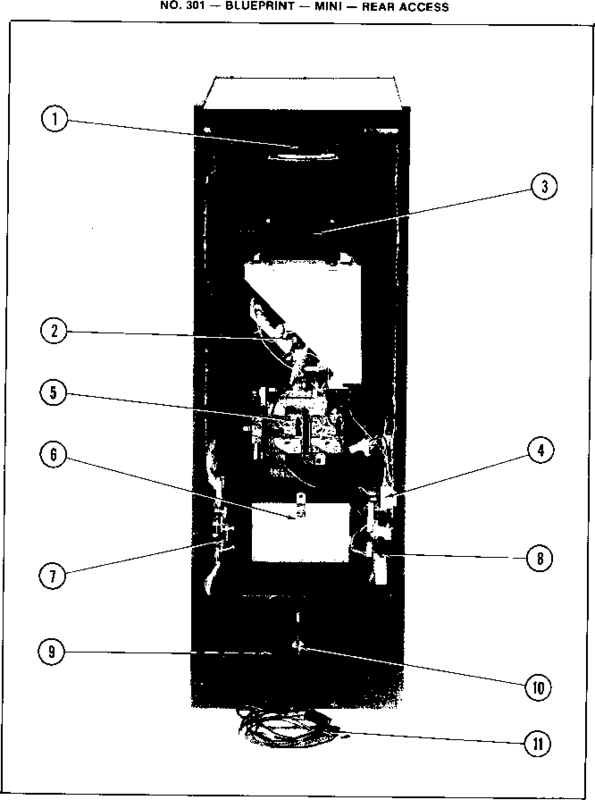 During this advertising period, sound is also output from the speakers on the right and left of the cabinet. Sound is not output if you have set the function to off. Each of the right and left start buttons is integrated with a light. The light flashes when coins are inserted sufficiently for a play. 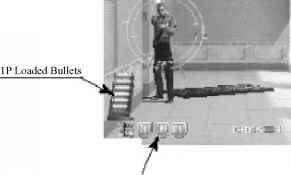 Based on a spy story this is a gun shooting game that enables two players to play simultaneously. Player, as an agent, must shoot the enemies in your way and thus try to perform a mission of each stage. The game provides total 3 stages. A military satellite was hijacked by an unknown group. A suspicious radio access to the satellite was detected and the radio source was traced to the History Museum. Your mission is to penetrate the Museum and to collect information. The collected information revealed a group that had hijacked the satellite. The group, named as Agares, seized Ms. Illina Mikahailova (one of the control system development staffs) and has forced her to falsely modify the system. Your mission is to recover her who is in the train for transference. Ms. Illina Mikahailova cooperated to successfully locate the base of the Agares. However, the Agares members are going to leave the base after having moved the military satellite control system into their submarines. Your mission is to penetrate the base and recover the control system. (^Whenever you insert a coin, credit number counts up on the bottom of the screen. 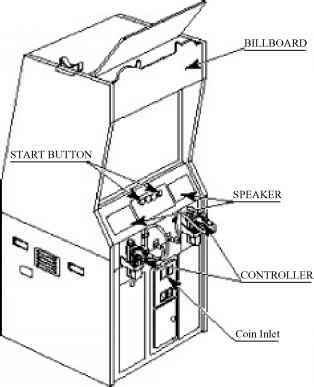 When you have inserted coins enough for a play, the INSERT COIN(S) message disappears and the PRESS START BUTTON message appears instead on the bottom of the screen. At the same time both the start buttons flash. Press either the two start buttons whichever you want to use for playing. Then a controller adjustment screen appears. 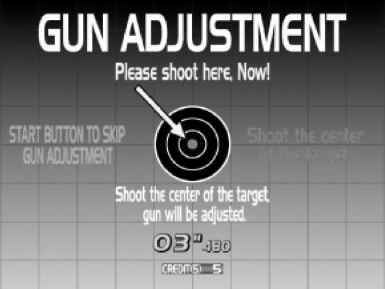 ©After you complete a gun controller adjustment, the system displays a screen that explains your mission of the stage. The loaded bullets and the remaining life number for a left-side player (1P) is displayed on the bottom left of the screen while for a right-side player (2P) the bottom right. The RELOAD message is displayed after shooting the 6 bullets out. Aim the muzzle outside the screen and shoot to reload the bullets. Your life number becomes zero (0), or (2) You have cleared the stage 3. • A regular enemy soldier (grenade-man, bomb-man, knife-man, etc.) appears over a sight on the screen. Shoot the soldier before the sight becomes red; otherwise you will lose life by one. • Shoot down the bullet from a grenade-man or bomb-man before it reaches you; otherwise you will lose life by one. • Shoot the knife-man before it swings down a knife on you; otherwise you will lose life by one. • If you shoot a civilian other than the enemy, you will lose life by one. Some specific events may take place stage by stage. If you succeed to play in the event, you can expect a desirable development of the game afterward. If you fail to play in the event, you can expect an undesirable development of the game afterward; for example the enemy will attack you more violently. Holding a strap that is suspended from a running rope, you glide down in the air and thus run after an enemy boss. Attacked by the enemies, you jump downstairs. • A boss character appears at the end of each stage. You can clear the stage by destroying the boss. • The boss is not destroyed until its life meter counts down to zero (0). • If you clear the stage, a MISSION COMPLETE screen appears. Indicates the number of hits. Indicates the total of combo and justice. Indicates the number of second and third hits out of your three continuous hits onto an enemy. The maximum 3 hits are justified to a single enemy. Indicates a hitting ratio (%). Indicates the latest total scores. By shooting the items that appear on the screen, you can obtain them. If you obtain an item, you can build up your armaments, recover your life, or increase your scores. By pulling the trigger, you can shoot the bullets automatically and continuously. The maximum 45 bullets are available. When all the 45 bullets are used, this item returns to an ordinary gun. A spot directed by the muzzle appears, in real time, as a pointer on the screen. You can shoot the bullets as many as you want within a time limit. 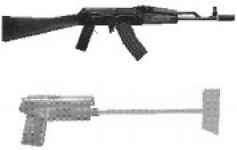 When a time limit is reached, the laser sight disappears and this item returns to an ordinary gun. This item enables to make an enemy's attack useless. The body armour disappears when once used against an enemy's attack. This item explodes when shot and can widely damage the target. The grenade disappears when once exploded. You can get 3,000 points. When this item is shot, three floppy disks appear. This item appears when you shoot the attach_ case item. You can get 5,000 points per piece. ^^ If you want to join in the game when another player is already playing, just insert the coins and press the unused start button; then the integrated light starts to flash. (It may be already flashing in the event that you have the credits enough for a play.) Press the flashing start button again; now you can play. NOTE: You cannot join in the game if the PLEASE WAIT A MINUTE message is on the screen. ©You can enter your name in an Internet ranking mode if you have taken the 20th or higher place in the points when the game has been over. - Make sure that an Internet ranking item has been set to on. - Pull the trigger and insert coins to activate an Internet ranking mode. 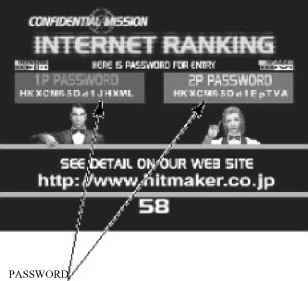 NOTE: A CONFIDENTIAL MISSION Internet score ranking is operated at a homepage of Hitmaker Ltd.
• For registering the password, see the homepage of Hitmaker Ltd. (http://www.hitmaker.co.jp). • In an Internet ranking mode, the difficulty settings are automatically reset to the values that are specific with an Internet ranking, in the event that this function has been set to on. If you insert the coins without pulling the trigger, however, the difficulty settings are not reset even in the event that this function has been set to on. • Destroy an enemy as soon as it appears. Obtainable point is highest if you destroy an enemy immediately after it appears on the screen. Point becomes lower when a sight is completed in red. The earlier you destroy an enemy the higher the point is. • Obtain a 'special hits' bonus point. You obtain a bonus point if you can destroy an enemy with special hits (justice and combo). See Page 41, "Clearing the Stage." • Obtain a bonus point from a successful playing in the event. You obtain a bonus point if you can succeed to play in the events that may take place stage by stage.